School Loop's Gradebook allows you to create multiple grade scales. The grade scales are universal, allowing you to use any of your custom grade scales for any gradebook or even any individual student. Naturally, the applicable grade scale appears on the progress report for you, your students, and their parents to see. The following steps will guide the user in setting a grade scale. From any page in your portal, click the Settings link (the gear icon) at the top right corner. Select one of your gradebooks (e.g. Law Enforcement5 ROP) in the Gradebook Settings section. In the Grade Scales (Universal) section, click Go. 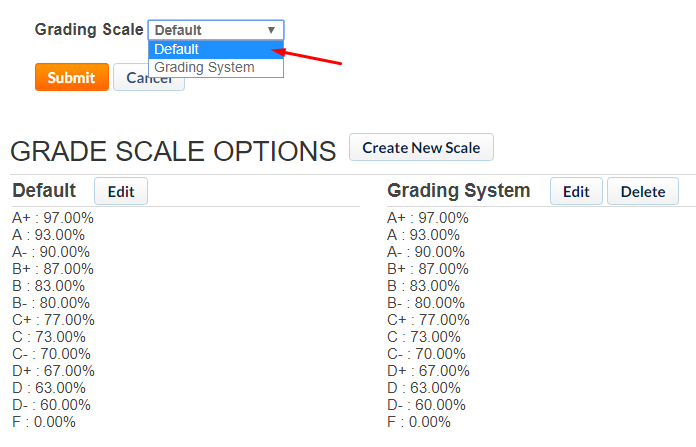 Choose the Default grade scale for your gradebook (e.g. Law Enforcement5 ROP). The Grade Scale that has been set will be applied in the selected gradebook (e.g. Law Enforcement5 ROP).